project in Sharswood with low-income rental houses. These homes are located on the 2300 block of Jefferson. Don't call the Kenney administration's new report on Philadelphia's housing market an affordable-housing plan. Sure, there are plenty of recommendations aimed at helping the city's poor keep a roof over their head. But the report goes after bigger fish. Its ultimate goal is to ensure that Philadelphia remains a middle-class city, no matter how many Comcasts or Amazons come to dominate our skyline. The plan, which is being released today, is a response to the upheavals of Philadelphia's decadelong building boom, which has turned some neighborhoods into glowing islands of affluence while completely bypassing others. Despite the furious arguments over gentrification and the 10-year property-tax abatement, this is the first time the city has ever tried to assess the housing needs of every income group, from the chronically homeless to the people scouting for million-dollar condos in Center City. The report's broad scope is a welcome corrective to the narrow way we usually talk about housing in Philadelphia. Judging from all the ink that the issue of gentrification receives, you might assume we face the same crisis as cities like San Francisco, Seattle, and New York, where even solidly middle-class people have trouble finding housing within their price range. As the new report reminds us, Philadelphia still has a 14 percent vacancy rate, even after nearly two decades of steady (but relatively slow) population growth. For a blunt illustration of just how different our situation is, consider these numbers: San Francisco's median home price is over $1 million. Ours is a mere $153,000. "Philadelphia's problem is not the lack of supply," Anne Fadullon, the city's director of planning and development, told me in an interview before the report's release. "Our issue is that the supply is very old, and people here have very low incomes." Built in the 1990s with public money by Germantown Settlement, this housing complex at Collom and Lena Streets in Germantown is boarded up because of neglect. Housing plans typically talk about the ways that cities can goose new construction. This one smartly focuses on retaining the housing we already have and making it better. That may not sound very exciting, but it's a good strategy for Philadelphia. Despite the blight and abandonment the city has endured over the last half-century, we are fortunate to have great housing stock in intact, transit-accessible neighborhoods like Frankford, Germantown, and Tacony. We should concentrate what little money the city can muster on making those places more livable. The plan estimates that Philadelphia will need to generate 10,000 new housing units a year to keep up with population growth over the next decade. But it argues that two-thirds of that annual number already exists. We just need to fix the units up. Among the more shocking statistics in the report is this one: 27,000 housing units in the city don't have working plumbing. The plan proposes beefing up programs that provide grants and loans to help low-income homeowners pay for crucial repairs, such as fixing a leaky roof or replacing a hot-water heater. Many of those repairs can be made for less than $5,000. That's a tiny fraction of the almost $400,000 it costs the Philadelphia Housing Authority to build just one, low-income rental house. 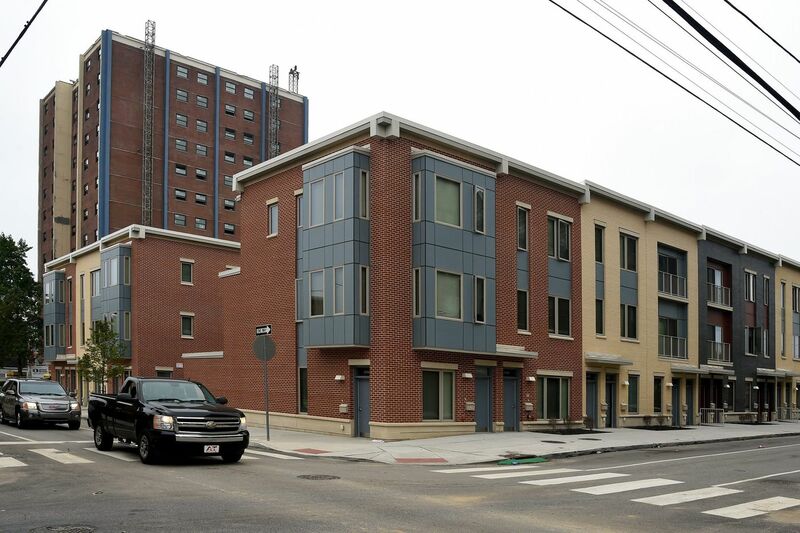 The Philadelphia Housing Authority has been slowly building new rental houses for low-income families in Sharswood, a neighborhood just north of Girard Avenue. The huge supply of fixer-uppers has been Philadelphia's salvation. As the city has revived over the last two decades, its cheap housing allowed people who earn modest salaries to raise families here, and enabled creative types to settle down and start businesses. Philadelphia has become a refuge for New Yorkers and residents of other overpriced cities. But Philadelphia is no longer the extreme bargain it once was and, as the plan suggests, that is reason for concern. "Seattle didn't think the [housing crisis] could happen to them," explained Fadullon, who just returned from a study trip to Amazon's hometown. "What we're learning from other cities is you have to plan for growth at the beginning." So, along with programs to increase housing options for the poor, the plan offers a generous menu to encourage the middle class to commit to the city. The report, which will be opened up for public comment, suggests that the city should expand a fund to assist buyers with down payments. It also recommends eliminating the onerous transfer tax for first-time home buyers. The income cutoffs are quite generous. A family of four earning $105,000 would qualify for both programs. Graduate Hospital has become an immensely desirable neighborhood over the last 15 years, especially garden blocks like this one on St. Albans Street. There are many other good ideas in the plan, which is titled "Housing for Equity: An Action Plan for Philadelphia." The report, a first draft, even goes out on a limb (by Philadelphia standards) and floats the idea of creating a two-tier wage structure for city's construction workers. One proposal calls on the notoriously high-priced trade unions to offer lower rates for affordable housing projects. Right now, private builders using nonunion labor can construct a rowhouse for half the price of one built by the housing authority, which is obliged to use union labor. In other respects, though, the plan timidly avoids several elephants in the room. It never once mentions the 10-year property-tax abatement, which has evolved into a subsidy for the city's wealthiest residents. The vast majority of abated properties are in the most successful neighborhoods, so why do we keep throwing money at them? The report similarly fails to address the Philadelphia obsession with parking. While the 2011 zoning code greatly reduced the city's parking requirements, it didn't go far enough. If you want to keep the cost of housing down, adopt zoning rules that actively discourage parking garages in new homes and apartments. You also won't find any mention of the way Philadelphia's tradition of councilmanic prerogative has kept the city from putting vacant land back into productive use. The Philadelphia Housing Authority is building a new headquarters on Ridge Avenue as part of its Sharswood redevelopment. The other aspect of the report that gives me pause is the proposal to increase the zoning densities in Center City and other desirable neighborhoods, a practice known as upzoning. I'm all for density. All neighborhoods should offer a mix of housing types: rowhouses, mid-rise, apartments, condos. A rendering of $2 million townhouses that are going up at Broad and Fitzwater Streets in South Philadelphia. The developer could have built multistory apartments on the site. Does that mean there should be no upzoning? No, but it must be done with surgical precision, otherwise we risk destroying Philadelphia's greatest asset: its pleasant, walkable neighborhoods. Just look what the Toll Bros. tower is doing to Jewelers Row, a city treasure that was mistakenly upzoned in 2011. Overall, the new housing plan gets the big ideas right. We need the best housing for the most people, poor and rich, and in between. Philadelphia Media Network is one of 21 news organizations producing Broke in Philly, a collaborative reporting project on solutions to poverty and the city's push towards economic justice. See all of our reporting at https://brokeinphilly.org.